Root Institute is appreciated as a tranquil, quiet place, an ideal setting for a restful stay. Yet our location offers so much more. 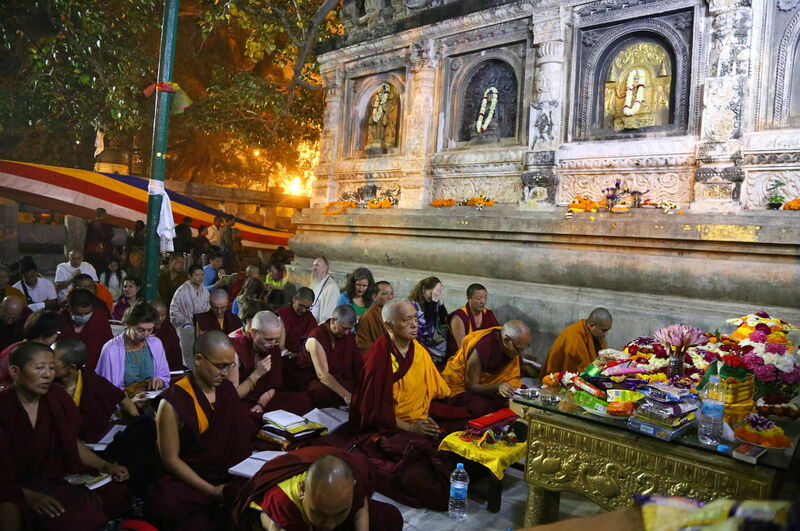 For Buddhists, Bodhgaya is the very centre of the world. 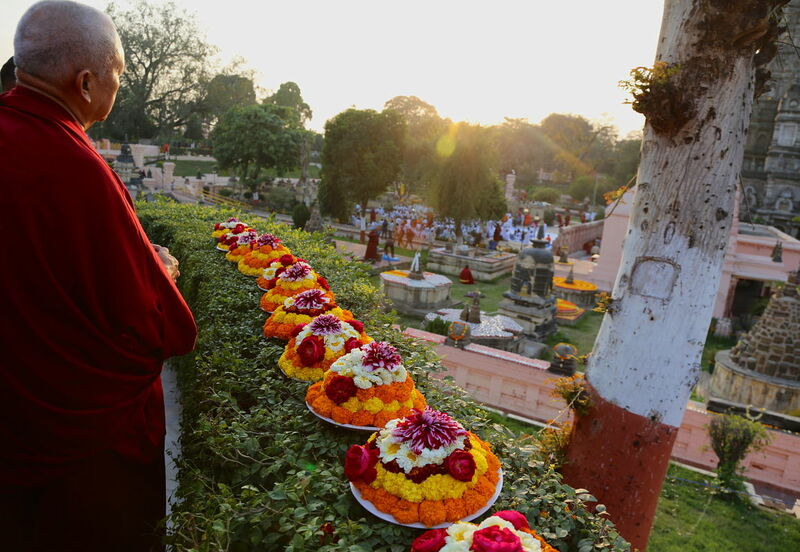 Bodhgaya is not only the place where the Buddha showed the holy deed of achieving enlightenment under the bodhi tree but also where all the great pandits such as Nagarjuna and Asanga practised and made so many prayers. Also, many great enlightened beings and yogis from Tibet, China, Nepal and other countries came here and made so many prayers to benefit us sentient beings so there would be unbelievable, unbelievable opportunity for us to purify negative karma and accumulate merit as quickly as possible. That is why it is so important to come to Bodhgaya to practice; to circumambulate and make prayers under the tree. Even if you don’t know much Dharma, try to circumambulate as much as possible. It makes your life so special; there is unbelievable purification and it collects so much merit to quickly be free from the oceans of samsaric suffering and achieve enlightenment. [The Mahabodhi Stupa] is so precious that if you don’t get to circumambulate it for even one day, it’s worse than losing skies filled with wish-granting jewels or billions of dollars. Circumambulation booklet (4 pages) – PDF – practices before and / or while circumambulating a stupa. Feel free to download and use these texts! Please treat them with great respect. 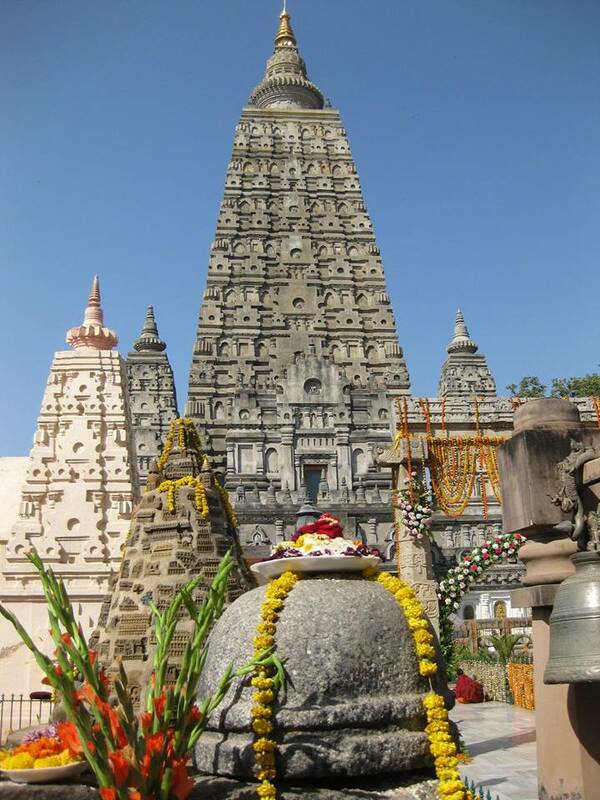 Bodhgaya is home to many holy sites where Shakyamuni Buddha spent time practising, teaching and meditating. The most famous and most blessed site is that of the Mahabodhi Stupa, the place where Prince Siddhartha (as he was known prior to Enlightenment) gained enlightenment some 2,600 years ago. This was where Buddhism began. Prince Siddhartha had been practising austerities for six years in an area close to the Niranjana River. Realising that this harsh, ascetic way of life could not lead to nirvana, he abandoned his practices and went to bath in the Niranjana. The physical hardships had taken their toll on the prince's body. Weakened by lack of food and drink, he collapsed on the riverbank, unable to move. At the same time a young girl named Sujata was passing nearby with an offering of kir, milk-rice, for the local spirits. She felt great compassion for the weary holy man and offered him the kir instead. Strengthened by this, the Prince bore himself up and continued on his way. Finding what looked to be a most suitable place, he took some kusha grass for a mat and sat under a pipal tree facing east. He resolved not to rise until he attained enlightenment. Throughout the night, Mara, Lord of Illusion (symbolising the delusions of one's own mind) tried tirelessly to break the Prince's deep meditation. Desire, jealousy, pride and many other powerful afflictions arose to serve as distraction but the Prince did not flinch. It was by morning that he had overcome his innate suffering and achieved ultimate nirvana. The prince was no longer, the Buddha was revealed in his stead. For seven days after the attainment of enlightenment, Buddha continued to meditate under the tree without moving from his seat. Another week passed in walking meditation, and for a third the Buddha contemplated under the bodhi tree. From here the Buddha strode out into the world and, upon the request of the Naga King, helped spread the Dharma. These teachings, or sutras, became the foundation for the many different Buddhist traditions we know in the world today. The Mahabodhi Stupa was built on the original site of the Buddha’s enlightenment, with the bodhi tree continuing to grow alongside it. Its origins are lost in time, but it is known that Emperor Ashoka erected a shrine to the Buddha here in the third century B.C. The modern temple is a fifty-metre-tall pyramidal tower, crowned with a bell like stupa. The base is a fifteen-metre-square twosome structure supporting four smaller towers identical to their central counterpart. Inside the temple sits a large gilded statue of Shakyamuni Buddha in earth-touching mudra. This image is said to be 1,700 years old and is facing east exactly at the place where the Buddha, sitting in meditation with his back to the bodhi tree, was enlightened. The earliest records of the bodhi tree are in the 'Kalingabodhi Jataka', which gives a vivid description of the tree and the surrounding area prior to the enlightenment, and the 'Asokavadana', which relates the story of Emperor Asoka's conversion to Buddhism in the third century. His subsequent worship under the sacred tree apparently angered his queen to the point where she ordered the tree to be felled. Ashoka then piled up earth around the stump and poured milk on its roots. The tree miraculously revived and grew to a height of 37 metres. In 600 A.D., King Sesanka, a zealous Shivaite, again destroyed the tree. The event was recorded by Xuanzang, along with the planting of a new bodhi tree sapling by King Purnavarma in 620 A.D. The tree stands inside a fort-like structure surrounded on the south, west and north by a brick wall. It has pointed leaves of a bright green colour. Having opened a door, one could see a large trench in the shape of a basin. Devotees worship with curd, milk and perfumes such as sandalwood, camphor and so on. The present bodhi tree is most likely the fourth descendant of that original tree to be planted at this site. It still performs a very important role to Buddhists of all traditions, being a reminder and an inspiration, a symbol of peace, of Buddha's enlightenment, and of the ultimate potential that lies within us all. To learn about other holy sites around the stupa grounds, you may like to visit Bodhgaya Mahabodhi Temple – Important Places.